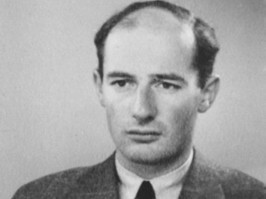 Passport photograph of Raoul Wallenberg, 1944. On January 17, 1945, Swedish hero of the Holocaust Raoul Wallenberg was taken into Soviet custody, never to be released. In the years since, countries around the world — including Russia, however belatedly — have celebrated his heroism, naming streets and schools in his honour, erecting monuments, and even (in Canada, Hungary, Australia, Israel, and the United States) awarding him honorary citizenship. In 2001, Parliament declared January 17 to be Raoul Wallenberg Day. Yet the circumstances of Wallenberg’s detention and disappearance remain a mystery. Indeed, until 1957, the Soviet Union denied any knowledge of his whereabouts. At that time, Soviet authorities claimed that he had died of a heart attack in 1947; suddenly, in 1989, they claimed that he had died in 1947 by execution. This contradiction was itself rebutted by compelling evidence that he did not die in 1947, but was alive for decades thereafter. Accordingly, when Russian President Vladimir Putin visits Brussels on January 27, International Holocaust Remembrance Day, European Parliamentarians should urge him to declassify archival information that would, at long last, clarify what became of the man the United Nations has called the greatest humanitarian of the 20th century. Raoul Wallenberg was a Swedish diplomat stationed in Budapest in the summer and autumn of 1944, during which time he is credited with having saved over 100,00 Jews. He is best known for saving some 20,000 Jews by granting them Shutzpasses, which conferred upon them diplomatic immunity. This influenced other governments, which followed his example and issued passports that saved thousands more from the Nazis. He also saved over 30,000 people by establishing safe houses protected by neutral legations. And he set up hospitals, soup kitchens, and day care centres to provide the vulnerable with a semblance of human dignity. Moreover, in November 1944, as thousands of Jews — mainly women and children — were sent on a 125-mile death march to the Austrian-Hungarian border, Wallenberg followed them, distributing food, medical supplies, and improvised certificates, once again saving people consigned to death. His last rescue was perhaps the most memorable. As the Nazis were advancing on Budapest, they threatened to blow up the Budapest ghetto and liquidate Hungary’s remaining Jews. Wallenberg had a warning sent to the Nazi Generals that they would be brought to justice, if not executed, for their war crimes. The Nazis desisted, and 70,000 more Jews were saved thanks to the incredible courage of one person who was prepared to confront evil. While Wallenberg saved so many, he was not saved by so many who could. Rather than greet him as the liberator he was, the Soviets, who entered Hungary as liberators themselves, arrested him on suspicion of espionage. He disappeared into the Gulag, and his family — along with the tens of thousands whose lives he saved — still do not know what happened to him. In 1990, I chaired the International Commission on the Fate and Whereabouts of Raoul Wallenberg, a group that included Nobel peace laureate and Holocaust survivor Elie Wiesel, Soviet scholar Mikhail Chelnov, former Israeli attorney general Gideon Hauser, and Wallenberg’s brother, Guy von Dardel. As outlined in our 1,200-page report, the evidence was “incontrovertible” — the term used by the U.S. Federal Court, which investigated the matter in 1984 — that Wallenberg did not die in 1947, as the Soviets claimed; “compelling” that he was alive in the 1950s and 60s; and “credible” that he lived into the 1970s and 1980s. Our commission concluded that, absent evidence to the contrary, Wallenberg was a disappeared person. Following our report, the Soviets arranged for us to visit Vladimir prison, where, witnesses claim, Wallenberg was imprisoned in the 50s and 60s. To our astonishment, we discovered that the Soviet officials who had made claims about his death had never themselves visited the prison, examined its archives, or interviewed any of its officials or inmates. Simply put, they had no basis on which to conclude anything regarding the fate of Raoul Wallenberg. Regrettably, important archival information and witness testimony that could have shed light on the circumstances and outcome of Wallenberg’s imprisonment was not made available to our commission, and remains classified. With the Russian President set to visit the European Parliament on the very day that the international community officially commemorates the Holocaust, he should seize the opportunity to engage in active and historic remembrance by declassifying these archives and finally revealing the truth about this great hero of the Holocaust. In the decades since the Second World War, too many of the guilty have lived out their lives in peace, while this saviour of the innocent was detained and disappeared. By saving more Jews during six months of the Holocaust than any single government, Raoul Wallenberg demonstrated the power of an individual with the compassion to care and the courage to overcome monstrous evil. For Vladimir Putin, as for us all, uncovering the truth about Wallenberg’s fate is both a moral imperative and a historic responsibility.